A.33 Heavy Assault Tank "Excelsior"
The A.33 Heavy Assault Tank "Excelsior" (or just A.33 Heavy Assault Tank "Excelsior") is a gift Rank III British heavy tank with a battle rating of 4.0 (AB/RB/SB). It was introduced in Update 1.67 "Assault" during the 2017 World War Two: Chronicle Event, unlocked after obtaining 11 Chronicle Awards. 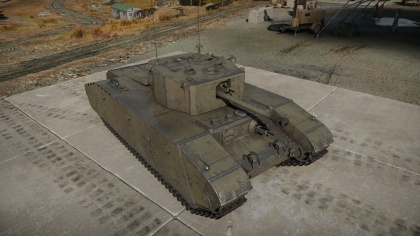 Based off the Cromwell chassis, the Excelsior provides a substantial armour upgrade with speed. Suspension wheels and bogies are 20 mm thick while tracks are 30 mm thick. -12 degrees of gun depression. Premium SL and RP rewards. 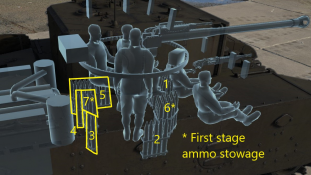 Large ammo rack in turret ring makes for easy detonation. Shells have no HE filler. The early combat experience of the Churchill infantry tank raised concerns on its reliability and speed, with a suggestion that production be halted while development focus on an "universal tank" for the British armoured forces to replace the cruiser and infantry tanks. However, until such a design could be formulated, they still needed a tank for the assault role the infantry tanks would take. Rolls-Royce Company, the company producing the prototype A27 Cromwells, suggested that the Tank Board use the A27 as an interim design with stronger armour, suspension, and armament. The suggestion was supported with the English Electric Company, whom plan to upgrade the A27 with thicker armour and elements from the American M6 heavy tank. On 07 May 1942, Tank Board approved for the production of these uparmoured A27 under the designation A33, though it would also have the name Excelsior. English Electric Company were in charge of producing the uparmoured A27 models and produced two prototypes. The first had the M6 suspension system and a 6-pdr cannon. The second had a wider track, different armoured skirts, additional frontal armour, and a 75 mm gun. Both used the same V12 Meteor engine as the A27. 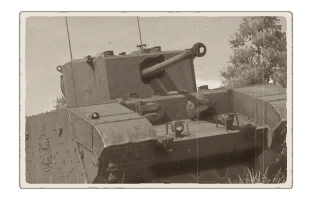 Reliability issues with the Churchill were soon ironed out by 1943, to the point it became a very successful infantry support vehicle and multiple variations were made based off the chassis. The A33 Excelsior, meant to replace the Churchill, was no longer needed and the project was dropped in 1943. Today, the second prototype can be seen at the Bovington Tank Museum. Newsome, Bruce. "TANK INFANTRY A38, VALIANT (E1952.39)." Tankmuseum.org. The Tank Museum, n.d. Web. 10 May 2017. Website. This page was last edited on 10 February 2019, at 22:22.